Well we did it. We bought a condo in one of our favorite locations. However, it’s in bad enough shape we’re on our way north to perform condo demolition before we can even think about allowing real live humans in there. I’ll take some before pictures and grab a macro shot of the furry mold growing on the walls. Doesn’t that make you hungry? No? Well then, I better stop talking and let this flavor-packed salad do it for me. For a vegan version, skip the eggs and Parmesan and add toasted walnuts. 1. Preheat oven to 400 degrees. Toss the halved potatoes with olive oil and season well with salt and pepper. Make on a foil lined baking sheet for 35 to 45 minutes, or until fork tender. Turn off the oven and let set for another 20 minutes to brown. 2. Divide the ingredients among 4 plates starting with the spinach. 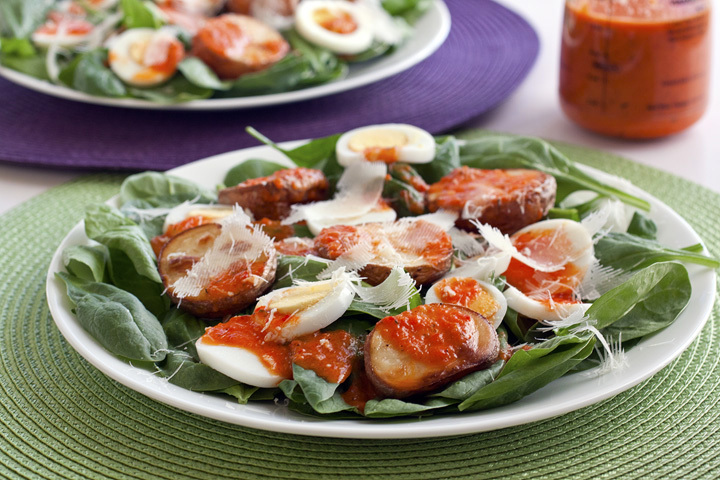 Top each salad with 2 tablespoons red pepper dressing and 1 tablespoon each of shaved Parmesan. White vinegar has a less stringent flavor than wine vinegars, making it possible to increase the vinegar and reduce the oil for a flavorful, but still balanced lower calorie dressing. Puree the ingredients together with a food processor or blender until smooth. Makes about 16 two-tablespoon sized servings. MEGA congrats on your purchase! That's super exciting. 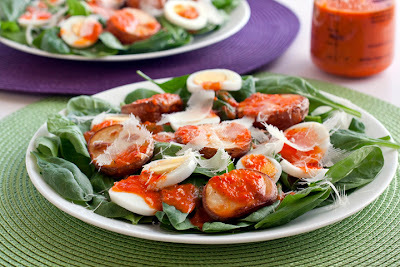 Love that roasted red pepper dressing...I'm pretty sure I'd want to dive into it headfirst! Congratson the condo. Hay, if it is a fixer upper, you can fix it up the way YOU want it. :) This dish is so colorful, i love it!